Board of Fun and Stars and Flowers present the first Clapton Zine and Print Fair at the Dentist! Yo Zushi will be launching his new album/zine “Smalltime“. Plus Ross Palmer, who will be launching his Board of Fun free download single “Little Differences”. And live poetry from the south London legend and our compere Jazzman John! On the launch night, doors open at 7pm. Entry is £3 advance/£4 on the door. The main fair on Sunday 5 May will be open between 11am and 5pm. 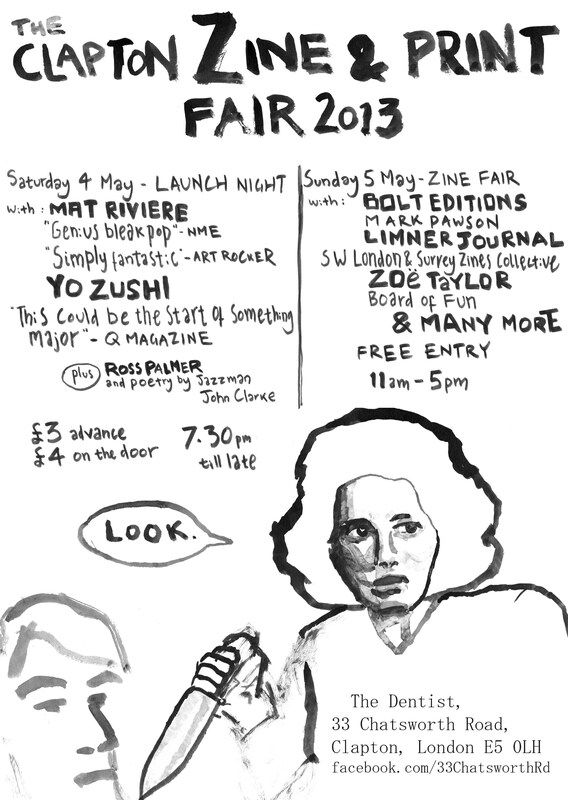 ENTRY TO THE ZINE FAIR IS FREE. The venue will turn into an indoor market selling zines, prints, cassettes, poetry books and badges from London’s most exciting DIY artists and publishers (see above list for some of the highlights).